Kevin McLennan – The beautiful hand drawn games produced by Daedalic Entertainment are quite distinctive, but what makes The Night of the Rabbit stand out from the rest? Matt Kempke – In The Night of the Rabbit we have created a pretty big world in which you can almost always freely explore – the player can even change from day to night to see what the inhabitants of Mousewood are up to at different times. For that to work in a pleasing fashion we had to combine our visual art style with sound effects and music in a way that makes places and times feel alive and coherent. Then there are strange and eerie places that are quite different in lighting, colours and music too. 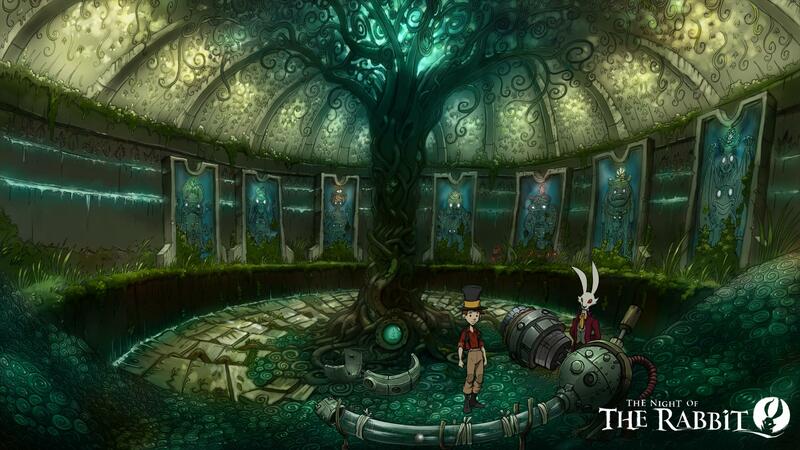 I think for The Night of the Rabbit we created a distinctive look and feel for the world and its characters also. Kevin – Do Daedalic allow you full artistic direction when it comes to implementing your story into the game, or are they pretty strict with what can and can’t be included? Matt – No, I had full artistic freedom there. In fact I had to be my biggest critic when it came to what fitted the tone of the story and what didn’t. Since I wanted The Night of the Rabbit to be a story that would work for adults and kids I had to avoid becoming too extreme and silly, or too cute. That wasn’t easy but I’m happy with how it turned out in the end. Kevin – How does the creation process work? Do you first come up with a story or is it a little here and there and everything then falls together like a jigsaw? Matt – For me it usually starts with a basic idea or story fragment – that’s when I catch fire. Then I start drawing and making notes and then, as you said, slowly the pieces of the jigsaw begin to form a picture. Kevin – Did you take any inspirations from real life characters and locations when creating The Night of the Rabbit? Matt – A lot of Mousewood and the nature in the game is based on my own strolls through the woods and fields – I’m a real romantic when it comes to nature. Jerry’s childhood is based a bit on my own childhood – we never had a house like he does, but we were always just five minutes away from fields and small woods because we lived at the edge of town just like Jerry does. Some characters in Mousewood are actually based on real life characters and most of them are me… just kidding. When I wrote the part of the wood dwarves in the original story they were actually based on me on a very grumpy day. The hedgehog brothers are also based on me and my brother, arguing about whether work should be fun or not. But I think all of the characters have elements of people I know or knew. The only difference is by now they have all become characters of their own and when I think of Plato the frog or Spitzweg, I just think of them as themselves – and as friends. Kevin – How long did the entire game take to make? For example, have you had the story locked away in a cupboard for years only to find the perfect match for it now in relation to visuals and production, or was it created purely for the purpose of the game? Matt – The eight stories from Mousewood, which you can find as audio stories hidden in the game, were written by me in 2005 and were never originally meant to be translated into a game. Most of Mousewood and its people stem from that collection of stories. The story about Jerry and the Marquis on the other hand is something my brother Sebastian first thought up in the autumn of 2010. Back then the characters didn’t have names and their stories just had beginnings, then when I began writing more and more I merged their stories with the story of Mousewood. Half a year later I pitched the game to Daedalic. In the autumn of 2011 I started working there and the game went into actual pre-production. Then one and a half years passed until the game was finished and ready for release. Kevin – The ending to The Night of the Rabbit was fairly open, will there be a sequel? Matt – Well I think there is potential yes, but I don’t think it’s necessary as Jerry’s story has been told. Yes there are questions that have been left unanswered, but the reason I didn’t answer most of them directly is so that players could come up with theories of their own. If you write about a world of magic and mystery the first thing you learn is to appreciate mysteries – they exist in everyday life too. Mysteries keep us going. No good story can be fully explained and told in such a way that wouldn’t lead to new questions. Take the Marquis and his background story for example, would he be such a mysterious and interesting character if we knew every detail of it? I think someday I will want to tell you more about the Marquis, Jerry and Mousewood and what happened to them all later on. So I guess the answer is: Maybe. Pretty mysterious, huh? Kevin – Aside from Jerry who is your favourite character? Matt – I couldn’t say that in general, but one evening I’d really love to hang out with Plato the frog and the Old Magician of Mousewood. I’m not sure they would communicate well with each other though… the Old magician is not into small talk or mail delivery and Plato keeps stressing that he is just a simple mail frog who doesn’t know the least about magic. But I think they would get on really well when they start to talk about past experiences, food and lizard people. Well, maybe that’s why I want to meet up with them, to find out for sure. Kevin – Do you have any other games planned for production in the coming months? 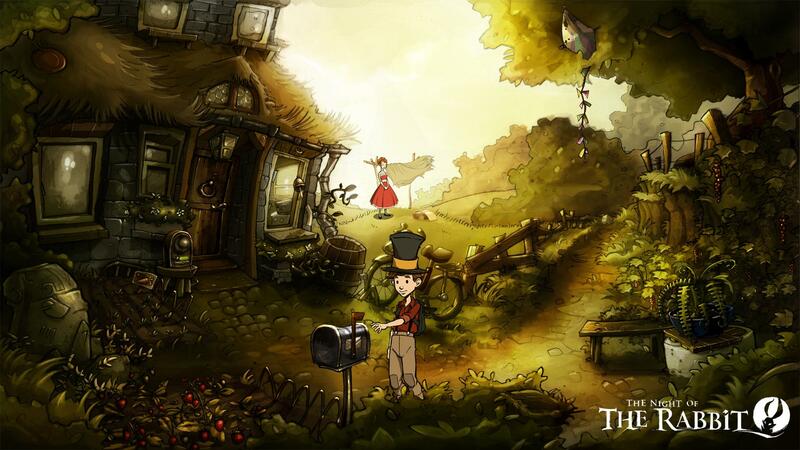 Matt – Right now I’m helping with dialogue and story for another game that’s in production at Daedalic. As for the next game actually written and directed by myself – it’s a bit too early to say what might be next. I am definitely interested in stepping away from old school adventure puzzles to try something new instead. Let’s see how that works out! Kevin – Are there any Easter eggs in The Night of the Rabbit that are yet to be discovered? Matt – I discovered one myself only four weeks ago. Just go to the installation folder and open up video directory and pen the last file with a video player. I’m proud of the team that kept that surprise for after the release, I really am. They are crazy. Kevin – Do you play many adventure games in your spare time? Or with all the time spent making your own, do you prefer playing a different genre? Matt – I like all genres as long as the game is good, but in the last few months I have not played as much as I would have liked, although I did have a look at some of the Sierra classics. Oh boy those were different times, those games were HARD. By today’s standards unfair even. It’s really interesting to see how games have changed and how people remember the classics. I love them, but they are almost impossible to finish without a walkthrough – at least if you have a day job and a social life. Kevin – Would you ever consider a cameo role in any of your future games, perhaps voicing a minor character? Have you done this in the past? Matt – For the German version of The night of the Rabbit I actually voiced Jerry’s dad – he only has four lines of dialogue so I thought it would be easy. I think my lines work well in the game, but I’d rather not do it again as recording the lines took half an hour. I can do podcasts or talks but I’m really, really not a good actor. Thanks to that experience I now know what hard work good voice acting is. Oh, I actually did a guest appearance in my last game What Makes You Tick: A Stitch In Time but I’m in disguise and I’m playing someone else, that was fun! Also because that game has no voices. The Reticule would like to thank Daedalic entertainment for arranging the interview and Matt Kempke for taking the time to answer our many questions.